In the 1020's, Count Radbot (985-1045) built a castle in Switzerland, and named it Habsburg. This castle became the namesake for the Habsburg Dynasty, whose empire would grow in important vastness until it commanded Spain, most of Central Europe and Italy, the Netherlands and various overseas territories at it's highest tide in the 17th century. Thanks for the auspicious beginning, Radbot! Due to a series of the usual power struggles and dynastic foolishness for which olde Europe is so adored, what are today the nations of Belgium and the Netherlands came to be under the power of the House of Valois-Burgundy, a French royal family, in 1433. At the beginning of the 16th century a series of royal marriages put the Habsburgs in charge of the Netherlands, and then the House of Habsburg split, with the "junior" branch being based in Austria and the bigger-deal branch being based in Spain...and suddenly and somewhat unexpectedly, Belgium and the Netherlands were ruled by Spain. The Spanish Habsburgs were not greatly esteemed by many under their rule. The reasons for this were many, but in particular the Habsburgs were not tolerant of religions that were not Catholicism: The famed Spanish Inquisition plied their reportedly-not-anywhere-near-as-torturously-barbaric-as-everyone-seems-to-think-these-days wares in the Habsburgs' dominions to actively discourage the scourge of Protestantism in its many wicked forms. 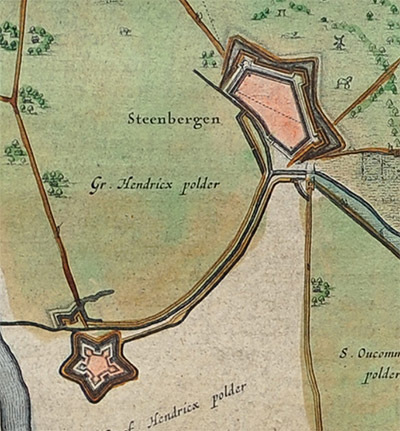 Fort Henricus at lower left, with the fortifications of Steenbergen at top right. Click on this thumbnail to see a Professor Van Shoten's gorgeous 1629 map of all the fortifications covering Steenbergen and Bergen Op Zoom to the west: I count six genuine starforts, plus two fortified cities and a number of smaller works! Sadly, of these only Fort Henricus and Fort de Roovere still exist today in a relatively presentable form. It was in fact this intolerance that would not only be Spain's undoing in the Netherlands, but was also the reason for the starfort of our current interest. In the mid-16th century the Habsburgs enacted strict edicts against heresy in the Netherlands, which drove thousands of Calvinists out of the country, frequently all of whose belongings had been confiscated. Those expatriates who could afford to do so lived in England, but a great many went into hiding and became outlaws, or became Watergeuzen, which translates, rather unkindly, as "sea beggars." These "beggars" became freedom-fighter pirates, sailing the seas around the Netherlands and doing whatever they could to weaken the Habsburg Empire's hold over the region, which generally took the form of disrupting trade and raiding coastal towns. The Watergeuzen were by no means all freedom-loving Dutch patriots: Their ranks were naturally leavened with a healthy proportion of criminals and other societal rejects. 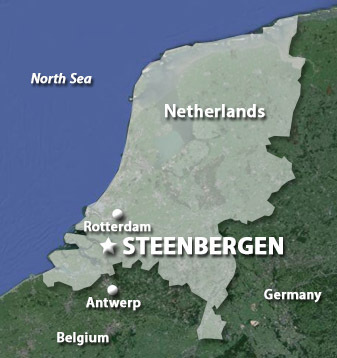 In 1572 the Watergeuzen attacked the city of Steenbergen. While this city did have a military garrison, it was apparently elsewhere at the time, leaving Steenbergen wide open for attack and plunder. Plunder the Beggars did, then swiftly departed before the garrison returned. The Eighty Years' War (1568-1648), in which the Dutch fought for their independence from Spain, brought conflict to Steenbergen again on June 17, 1583. A Spanish army and a Dutch army fought a running battle betwixt Bergen op Zoom and Steenbergen, and once the Dutch had been defeated and the Spanish had retired to the lands they commanded to the south, the Dutch determined that fortification was, at long last, in order. Sort of. Much of the southern Netherlands is pierced with navigable rivers, and Steenbergen owed it's commercial success and growth to the River Vliet, which connected the city to the Volkerak, and thus the Atlantic Ocean. 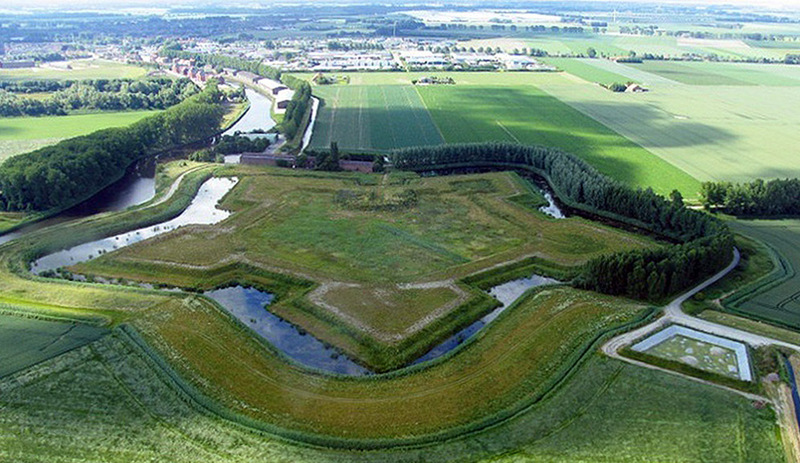 The first fortification to project Spanish power in the region was de Leur Schans, a small fort at the spot where the Vliet connects to the small canal that flows through the city (the name of this canal, for some reason, has proven to be beyond my powers of discovery). The Spanish built the fort, but nobody remembers what it was called or what it looked like, which is not particularly helpful for our purposes, but one plays the cards that one is dealt. A period of negotiation began in 1609, which led to a truce that would last 12 years...but the Eighty Years' War was still scheduled to run for a few more decades, and once fighting recommenced in 1621 it was more vicious than ever. The Spaniards returned in July of 1622 and had their way with Steenbergen once again. After a brief siege that was noteworthy chiefly due to the role that Steenbergen's "wives" played in their determination to not defend the city from it's attackers (five cannon were sent to Steenbergen to aid in that city's defense when it was learned that the Spaniards were attacking nearby Bergen Op Zoom, but the "wives" obstructed the guns' arrival and dumped them into the harbor), the city was taken by the Spanish. And taken back by the Dutch, and taken back by the Spanish, and taken back by the Dutch...Steenbergen would change hands nine times in 1622. Though a relatively secure, walled city at the start of this process, Steenbergen, along with much of it's population, was destroyed that year. Someone's industrious Photoshop work: A lovely 3D graphic laid atop Fort Henricus' current form. Sure, this was probably what the fort looked like when at the height of it's mystical powers, albeit without any guns or interior structures...it's also what a birthday cake for Vauban might have looked like! The annihilation of most of Steenbergen finally pushed the Dutch over the edge into the lovely abyss of strategic fortification, and in 1621 work commenced on an enormous defensive work: The West Brabant Water Line. 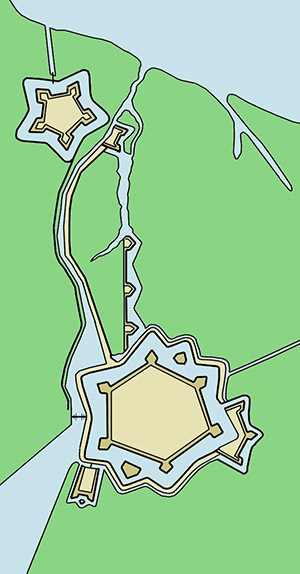 Stretching the 11 miles from Steenbergen to Bergen Op Zoom, the West Brabant Water Line comprised the two aforementioned fortified cities; starforts Fort Moermont, Fort Pinssen, Fort de Roovere and Fort Henricus; and a series of walls and other outerworks. Fort Henricus and it's relation to Steenbergen. Note the hornwork across the river from Fort Henricus, which helped to protect the sluice from which the inundation was controlled. Most of the work on the starforts themselves was completed in six months, a remarkably swift construction period for one starfort, much less four! Fort Henricus was built atop the remains of the previous Spanish fort at the mouth of the River Vliet, where it played the important role of Sluice Dominator, a designation that I just made up...but one that would have been fitting, as a river channel was controlled at the fort which was designed for the defensive purpose of inundation. The name "Netherlands" literally means "low country," which refers to the fact that much of the nation's land is below sea level. As such, flooding has always been far too easy to accomplish, which in the case of the Brabant Water Line was used to the advantage of the Dutch. With the opening of the sluice commanded by Fort Henricus, the land over which an attacker would need to approach and attack Steenbergen would be inundated with water. While this would not have made attack impossible, it sure would've slowed things down! The sluice was protected by a hornwork across the canal from Fort Henricus. While it is tempting to suppose that Fort Henricus controlled the inundation possibilities for all of Holland, this was not the case: Several other dams, dikes and sluices were located to release both fresh-and saltwater for strategic flooding purposes. When the Spanish made a major effort to dislodge the Dutch in 1631, inundation worked extremely well, causing the Spaniards to flop wetly and ineffectually about during an attempted attack around the little town of Slaak, some 35 miles north of Steenbergen. Spain learned, however, and five years later brought shallow-draft barges along when attacking Steenbergen. 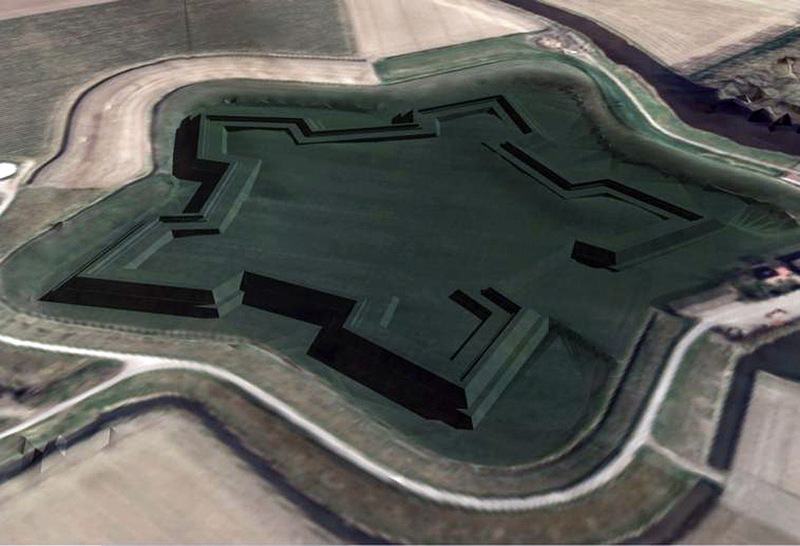 Only the quick building of additional Dutch redoubts kept the Spanish out of the town in that instance. The Brabant Water Line was kept strong. The War of Austrian Succession (1740-1748) brought the French army to nearby Bergen Op Zoom in September of 1747, but contented itself with the brief conquest of that town and did not attempt to attack Steenbergen. In fact, nobody ever tried to attack Steenbergen again. Fort Henricus' sluice was opened in anger but once more, to hamper an expected British attack on French-occupied Zeeland in 1809 during the Napoleonic Wars (1803-1815). Seemingly, the Brabant Water Line was the perfect combination of starforts, fortified cities and threatening inundation to dissuade any would-be attacker! level one would be fortunate to even notice that one was in the presence of starfortery! Perhaps not, as it appears that Fort Henricus was demolished in 1812, which was still during the Napoleonic Wars, when the Netherlands were part of the French Empire. Was our starfort done away with in order to make the region safer for Napoleon's garlic-eating, moustachioed horde? Unclear. Regardless, the French left the Netherlands after Napoleon lost the Battle of Leipzig (October 16-19, 1813) and was forced to collect his far-flung troops and slither back to the motherland. The fortifications around Steenbergen were officially dismantled in 1827, though it remained a garrison town for some time thereafter. "We don't need fortifications," blustered the garrison. And, ultimately, they did not. 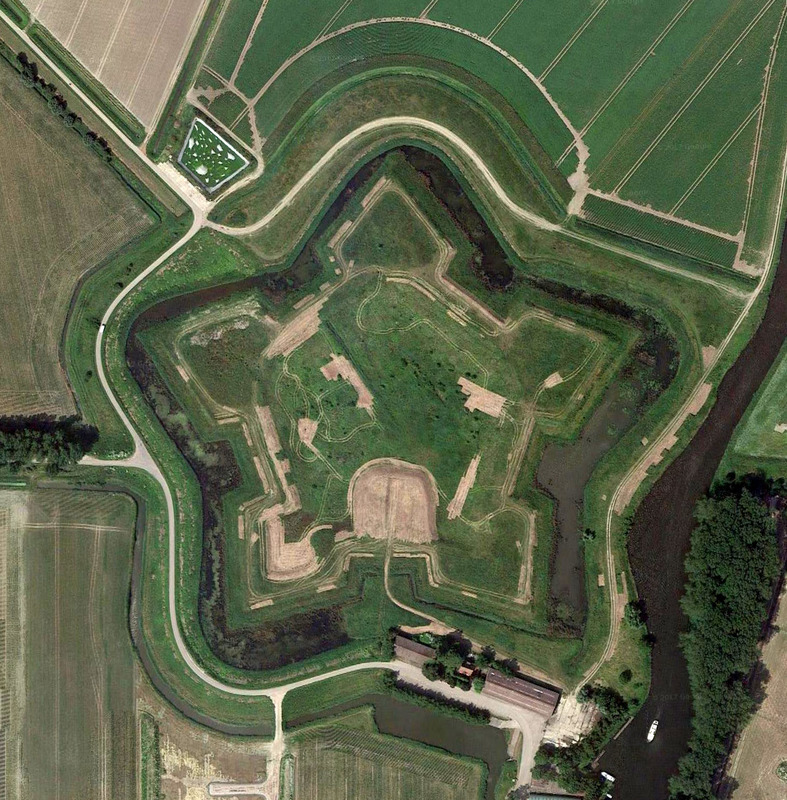 The only foreign army to make itself known to Steenbergen after the War of 1812 was that of the Nazis in 1940, during the Second World War (1939-1945), but no amount of 17th century fortification would have kept them out anyway. The First Canadian Army liberated Steenbergen in 1944, and Fort Henricus and the city's other defenses peacefully continued their long road to ignored decrepitude. 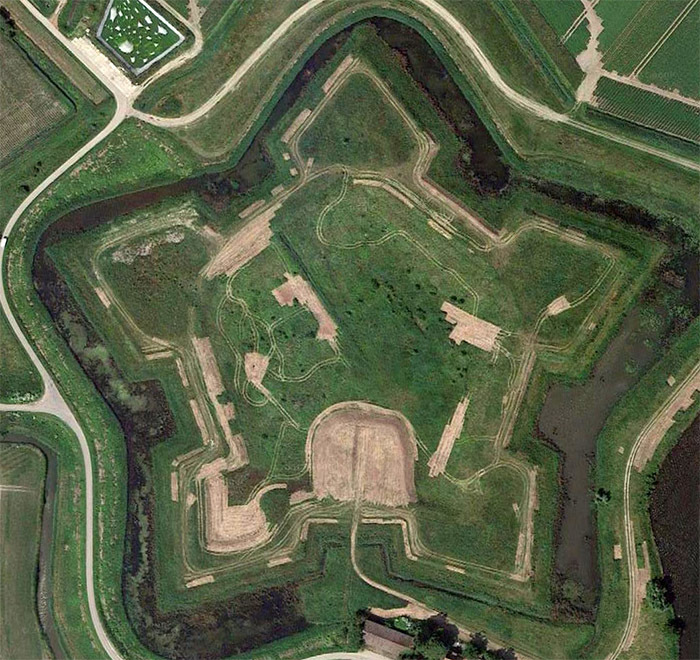 Fort Henricus is certainly much more impressive when viewed from a 45° angle. 1983 saw a kindling of interest in the restoration of some of Steenbergen's fortifications to their former glory, and in 2008 an effort began for the restoring of Fort Henricus which, going by recent pictures of the fort, doesn't seem to have accomplished much...unless Fort Henricus had been completely buried under rocks and thorn bushes prior to 2008. The fort is today owned by the Natuurmonumenten organization.